Every so often a love story captures our hearts and becomes more than just a story - it becomes an experience to treasure and to share. The Notebook is such a book. It is a celebration of a passion both ageless and timeless, a tale of laughter and tears, and makes us believe in true love all over again. At thirty-one, Noah Calhoun is rebuilding his life on the coast after the horrors of World War II, but he is haunted by images of the girl he lost more than a decade earlier. Allie Nelson is about to marry into wealth and security, but she cannot stop thinking about the boy who stole her heart years ago. And so begins an extraordinary tale of a love so strong it turns tragedy into strength and endures everything ...2014 marks the 10th anniversary of the film adaptation of The Notebook starring Ryan Gosling and Rachel McAdams. 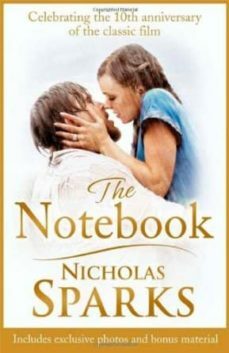 This new edition includes gorgeous colour photographs from the film, author Q & A, discussion questions and an exclusive chapter from The Longest Ride, the new Nicholas Sparks novel.